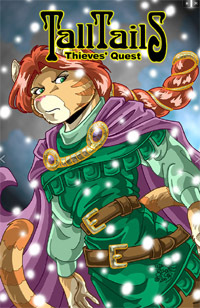 Collecting over 20 issues of the original “Tall Tails” comic and clocking in at a whopping 550+ pages, Lage and Calderon’s Tall Tails: Thieves’ Quest is a massive blast from the past. This fantasy/anthro comic’s original print run began in 1993 and wound all the way through 2002 through various indie comic publishers. 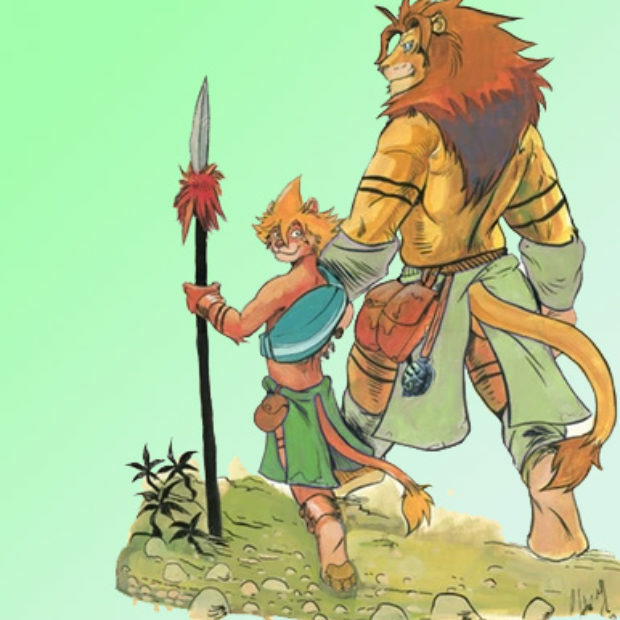 Lage and Calderon’s Kickstarter project collects the first, and arguably primary, arch of the story in one huge book, a happy return to print for a comic that’s only available in back issue boxes at conventions. The story is strong-but-standard fantasy fare: an adventuring party searches for the Lost Something of Somewhere (Wikifur suggests that the comic was, at least in its dusty origins, a furry pastiche of Monty Python’s “Holy Grail.” I can’t confirm or deny it, but there ARE universal fantasy tropes, and the Search for the Magical McGuffin is a proud and honorable plot thread.) 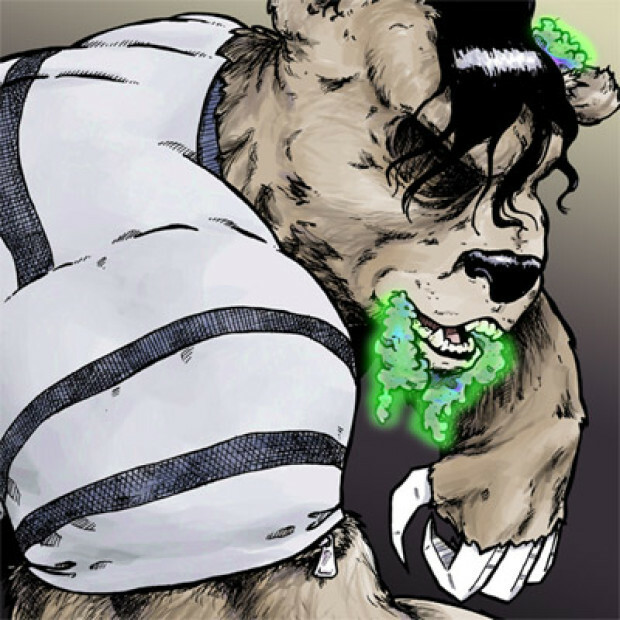 But over and above the traditional content, Lage’s artwork, with its lifelike and natural poses and expressive characters, makes the series stand out as a very strong part of the furry graphic storytelling world. This kickstarter itself has a fair amount of RL backstory. Life and artists are complicated. While I love Lage’s work and am quite happy to see this Kickstarter launch, there was some initial back-and-forth for me. Lage had edged away from the Fandom a decade ago. There are very good reasons for this. Entitled and snarky fans (and bloggers), the occasional genuinely evil online cretin, the frankly weird culture that goes frankly weird places, the difficulty in being “professional” and “furry” at the same time, the challenge of being an artist with a strong adult portfolio illustrating in a professional capacity. So, I was prepared to spend 50 words or so (but only 50!) grumping about an inside/outside approach to the fandom. I can understand the choice, Lage’s retreat from the fandom was in 2000-2002, what I consider the Dark Ages of the fandom—hostile media coverage and no shortage of internet hate. Not just from external sources. I hereby withdraw my grumping. For the first time in ~14 years, Mrs. Lage returned to the Fandom, attending Anthro New England as an artist, along with Calderon. It’s exciting to see an artist from the Furry Golden Age return in the post-millennial era, where furries have been partially mainstreamed. And maybe it was specifically to help with the book launch, but you know, that’s okay, it’s still a welcome return, and shows that the fandom has value to the artist. It’s also worth pointing out in the project video that she specifically references Tall Tails as a furry comic. Involvement in the community is a good thing, it helps ensure that there’s a community, and one with a history and a legacy. Re: The Kickstarter itself, it’s lacking in some of the stuff I’d hope for, namely fan-service inclusion and commissionables. This is primarily a reprint-focused Kickstarter, and if you look beyond the awesome sample pages and solid infographics, it’s a very spare project story, only perhaps three paragraphs of text. 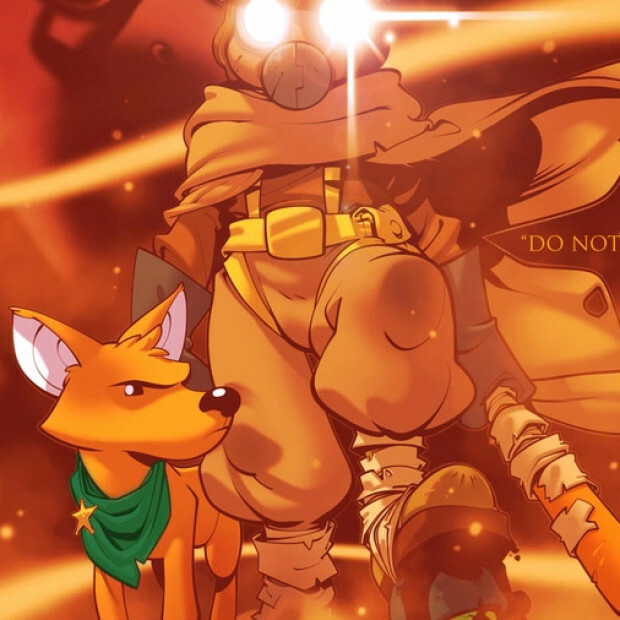 It’s unreasonable to make “backer-created content” a condition of a successful kickstarter, but that is the driving force behind the higher pledge points in projects like Anubis: Dark Desire and Expanding Horizons: Artist’s Journey to Africa. There’s also some choices in the pledge points that strike me as a little weird, and clearly weren’t successful—the digital versions of just issues 1-9 or 1-15. You could argue that including these oddball pledge points didn’t hurt the campaign, but something that doesn’t help AND takes up extra screen real estate is overall a detriment to the project. Do what you can to avoid standing in the way of your customer spending money. But hindsight is 20-20. 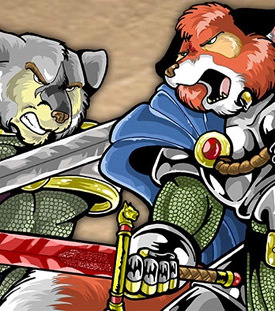 Graymuzzles and fantasy fans that enjoyed the original series have an additional reason to support this project. With Tall Tails online with updates, Lage making some steps back into the world of the fandom, and the suggestion of a new title, and two more story arcs yet to be seen, supporting this project even at a “hug” level is strong encouragement for future furry work. Follow @furstarter on twitter for the latest fur-friendly crowdfunding projects!